The presence of Cristiano Ronaldo in Group F adds some much-needed glamour to one of the less appetising line-ups at Euro 2016, although the four teams battling it out do at least represent a cross section of Europe's different cultures and geography – from frozen Iceland in the north, to sunny Portugal in the south and across to the heart of central Europe, where east and west collide. Portugal could not have hoped for a better draw and it would be a shock if they failed to top the group, while failing to qualify for the last 16 is almost unthinkable. "Portugal are something of an enigma," says Eurosport. "Instinctively, you reach towards naming them among the favourites for a tournament... But there is also a sense that they never quite deliver and a poor performance at the World Cup two years ago was perhaps a reflection of their modern-day reliance on Cristiano Ronaldo." However, Fernando Santos's team have "a good blend of young and old", says The Guardian, with the likes of Joao Mario and Renato Sanches now emerging alongside the mighty Ronaldo and other veterans including 38-year-old Ricardo Carvalho. This is the first time that Austria have qualified for the European Championships – their only previous appearance was as hosts in 2008 – but they could do better than some expect after a brilliant qualifying campaign. "This is a smooth footballing side that packs genuine punch and they will have valid 'dark horse' status in France," says Eurosport. Coach Marcel Koller "has fostered a tremendous spirit in a squad whose nucleus is drawn from the side that made it to the semi-finals of the 2007 U-20 World Cup", adds the Daily Telegraph. And there are some well-known players in the ranks including English and German title winners Christian Fuchs of Leicester and David Alaba of Bayern Munich. Marko Arnautovic of Stoke could make an impact as well. "One of the many Cinderella stories of this tournament, Iceland are the smallest nation ever to qualify for the European Championship, but they're by no means the weakest," says ESPN. They twice beat the Netherlands and kept six clean sheets in qualifying. Romantics will note that Iceland has an almost identical population to Leicester (around 330,000), and everyone knows what that city's football team achieved last season. With three qualifiers from most groups, Iceland "are convinced they can come through Group E and then give anyone a game in the knock-out stages, and given their meteoric rise it is certainly hard not to be swept along by the confidence surrounding them", says Eurosport. The once-mighty Magyars are vying with Albania for the title of least fancied team at Euro 2016. This is the first tournament they have qualified for since 1986 but they are unlikely to set the place on fire. "Out of the 14 goals scored in qualifying, five came from corners, one direct from a free-kick and two after a free-kick was not cleared properly by the defence," says The Guardian. If you are looking for stars in Group F, then Portugal is the only place to go. In Cristiano Ronaldo they have the biggest name in European football, but his supporting cast features some rough diamonds. Young Renato Sanches recently signed for Bayern Munich, while Joao Mario has had his every move followed by armies of Premier League scouts. William Carvalho is also a player linked with a move to the Premier League big guns. Well lads and lasses it's the match we've all been waiting for - Austria v Hungary. Seriously though - the two nations did a lot for revolutionising football tactics in the first half of the 20th century so it's interesting from that point of view...at least. No one gives a toss. I just want Ronaldo to put 6 past Iceland for my Fantasy team. Well at least I tried! Looking forward to the Portugal v Iceland match tonight. Of course I'll be cheering on Iceland even if it means them only getting 20% possession! This is far too long to post in an article on here but it's worth reading the Guardian article below to learn more about Iceland's rise. Yet another late goal in this tournament. Good to see our unwanted youth player Kristzian Nemeth on the pitch at a European Championships. Didn't expect it to be a decent game tbh, but I enjoyed it!! And as mentioned, it was nice to see Nemeth on the pitch!!! No William Carvalho or Quaresma for Portugal. Shame as i really wanted to watch both of them. Quaresma was outstanding (against Estonia) and he's so fun to watch on his day (happens once every full moon). Really rated William Carvalho when i saw him play for the Portuguese youth team. I'm sure he's been part of the senior side for a while but not today. Will Iceland bring Peter Andre on ? Amazing that Iceland are in the Euros and they've got a population about the size of Sefton. Nice to see we don't have the monopoly on sh*t corners . Top marks to Iceland holding Portugal to a draw.....Big head nancy boy couldn't even score against them, pleading with the Ref evey time he was breathed on, can't stand the whingebag. Get the f**k in there Iceland! The commentators seem seriously shocked by this result but I'm not at all. They had it in them to win the game too. Portugal= Overrated team and as a whole overrated players that the clubs within Portugal want top £ for. Loved the way lady-boy sulked off the pitch with an incredulous look on his face while the rest of his teammates shook hands and exchanged tops with the Iceland players. Mind you sweet pea probably would have traded his top with another player if they were carrying they're wallets with them or were up for a midnight rendezvous in his hotel room. Ahhh - school history, specifically World War I! They totally did! I thought they were awesome. Direct and played with clarity, a clear purpose. Seeing as they qualified from a group containing Turkey, the Czechs and the Netherlands then this draw was perfectly expected. Thought Portugal as ever were overhyped and overrated. Ronaldo...well he was sh*t and I curse all those commentators who treat these kind of tournaments and matches as the centre of all that is happening in the world because Ronaldo is playing. The commentators almost make it out as though he has a right to score but his performances for Portugal and the Portuguese in general don't deserve that sort of sycophantic treatment. Well done Iceland. Had the game streaming on my phone as I drove to my exam. They were efficient in defence and could have won it. C**t boy Ronaldo was my fantasy captain but glad he failed again. Can't stand the pr**k.
Portugal star Cristiano Ronaldo hit out at Iceland's lack of ambition after the two sides drew 1-1 at Euro 2016. The Real Madrid player also refused to shake the hands of the Iceland players after the group match in Saint-Etienne. "I thought they'd won the Euros the way they celebrated at the end," he said. "It was unbelievable. We tried hard to win the game and Iceland didn't try anything. This, in my opinion, shows a small mentality and they are not going to do anything in the competition." But former Iceland international Hermann Hreidarsson called Ronaldo "petty" and a "sore loser". The former Ipswich, Charlton and Portsmouth defender, 41, told BBC Radio 5 live: "He thought he could have goals handed to him on a plate. "If he would have worked as hard as every Icelandic player, he wouldn't have had to say anything because I'm sure he would have got his rewards. "He didn't fancy it on the day and he just got beaten up." Ronaldo, making his 127th appearance for Portugal, said it had been a "lucky night" for his opponents and accused them of putting "the bus in the net". Portugal had 72% of the possession and 26 shots on goal to Iceland's four. "Portugal try to play football and try to win the game," said skipper Ronaldo, 31. "Iceland didn't try anything. "They were just defend, defend, defend and playing on the counter-attack." Ronaldo's words have drawn plenty of comment on social media. DunsbyOwl tweeted: "Great Result for Iceland. Shame Ronaldo couldn't show a bit of magnanimity." Paul said: "Just when Ronaldo was winning the footballing world over with his talent, he opens his mouth again..."
AndyG added: "Cristiano Ronaldo has just reminded me of all the reason why I just can't like the bloke. Still recall his wink after Rooney's Euro red card." Iceland, appearing in their first major tournament, boast a population of just 330,000 and are the smallest nation to play at a European Championship finals. They finished second in their qualifying group, above Turkey and the Netherlands, who failed to make it to France. Birkir Bjarnason's volley earned them a point against Portugal after Nani had opened the scoring in the Group F game in Saint-Etienne. Hungary top the pool after beating Austria 2-0 earlier on Tuesday. What a complete c**t. Kind of idiotic of him to call Iceland a team with small mentality after drawing to them(and could have lost to them too), so if their mentality is so small, what does that say about the Portuguese team? What were Iceland suppose to do against a plethora of exceptional talent, all out attack and let Ronaldo score just so he can be happy? Of course they are gonna f**king celebrate after grinding hard and gaining a point against a big European team, one step close to qualifying for the next round. I actually thought at times during the game that Iceland could nick the win. They may not have had loads of possession but their attacks were efficient and they created a few chances from them. 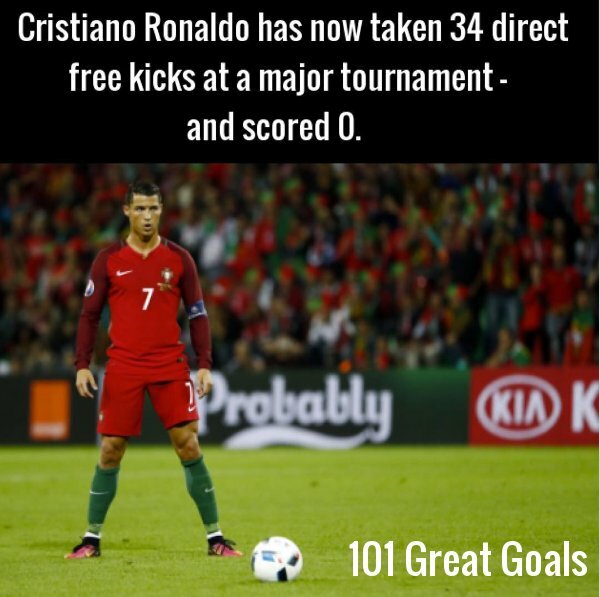 Ronaldo needs to worry more about how sh*t Portugal have become in tournaments than how small time Iceland seem to be. He really is a sad example of a sports man, more like spoilt child. Monumental player, Ronaldo, but if he was one of your mates, there'd be a WhatsApp group he didn't know about. Great player but a vain and empty soul. The sort of guy that alpha male lads love because they don't have two brain cells between them to realise that he isn't the image of a real man. Gutted for Iceland and that late late equaliser. Defended so so well and I love their efficiency and precision. They know how to make the most out of the little resources they have and a 1-0 win would have been a real fairytale for them.